How effective colour can be. Great contrasts in the traditional T-shirt. Especially in the colour combination. Bleached grey is the perfect background for the expressive deer, which is embroidered with many small sequins. 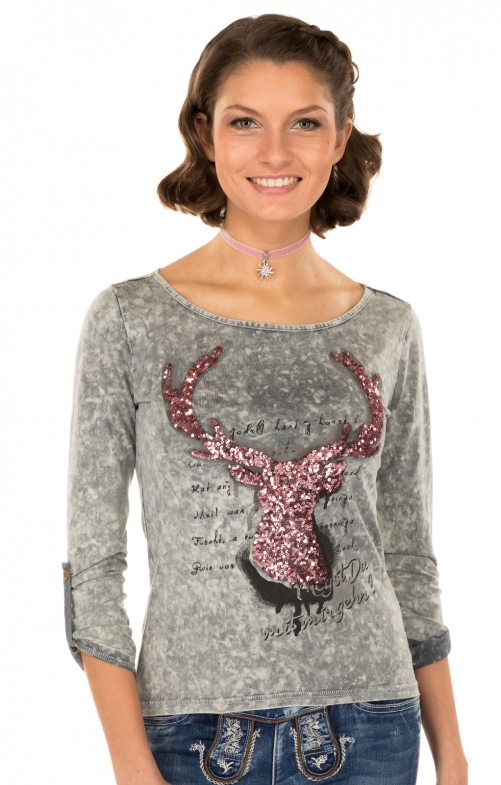 The deer motif is more trendy than ever and fits so well with this shirt. The traditional shirt convinces with small nice details such as the held with a buttoned cuff and the colour-contrasting shirt inside. Sehr gute Verarbeitung, schönes Shirt, Preis Leistungsverhältnis okay. Auch ein schönes Shirt aber im Vergleich zu den anderen bestellten Shirts hat mir dieses nicht gefallen und ging zurück.